A Center for Azerbaijani Studies solemnly opened at the University of Warsaw with the support of the Azerbaijan International Development Agency (AIDA). In his speech, Azerbaijani ambassador to Poland Hasan Hasanov stressed the importance of the Center. The Ambassador noted the comprehensive development of relations between the two countries, Trend reported. The event was also addressed by Dean of the Faculty of Oriental Studies at the University of Warsaw Piotr Taracha and Head of the Department of Turkology and the Peoples of Central Asia Agatha Barey. 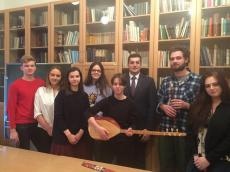 They noted that the teaching of the Azerbaijani language and culture at the University of Warsaw, carried out with the support of A?DA since 2013, had a positive result, and the creation of the Center for Azerbaijan Studies was a significant continuation of this activity. The opening ceremony was also attended by the head of the program on teaching the Azerbaijani language and culture Shahla Kazimova, director of the Institute of History of the Academy of Sciences, academician Yagub Mahmudov and deputy director of AIDA Aliya Agazade. Center worker Nargiz Akhundova made a large presentation on the Azerbaijani-Polish historical relations and the goals and activities of the Center. Azerbaijani-Polish cultural relations have a long history. In 1827, an Azerbaijani orientalist, professor at St. Petersburg University, Mirza Jafar Topchubashev translated the Crimean Sonnets by great Polish poet Adam Mickiewicz into Farsi. In the 19th century, such great representatives of Azerbaijani literature as Abbasgulu Agha Bakikhanov, Ismail Bey Kutkashenly visited Polish soil. Here Bakikhanov wrote a cycle of poetic works and the treatise "?srarül-m?l?kut", explaining the teachings of Nicolaus Copernicus. Azerbaijan and Poland also enjoy significant prospects to expand cooperation in the agricultural, industrial, ICT, tourism and energy sectors. More than 20 companies of Poland operate in Azerbaijan, especially in trade, industry, transport, service, construction, insurance, banking and other fields. Poland recognized the independence of Azerbaijan in 1991. Diplomatic relations between the two countries were established in 1992. The Embassy of Poland was established in Baku in 2001. The Embassy of Azerbaijan was established in Warsaw in 2004.